Abstang horses were created by Michele Brown of Utah in 1990 by breeding an unrefined feral mustang with an Arabian thoroughbred. The Arabian horse then gave birth to what is now known as an Abstang. Because this Abstang mixes two bloodlines, their characteristics vary considerably. Especially since Mustang horses vary greatly in physical appearance. 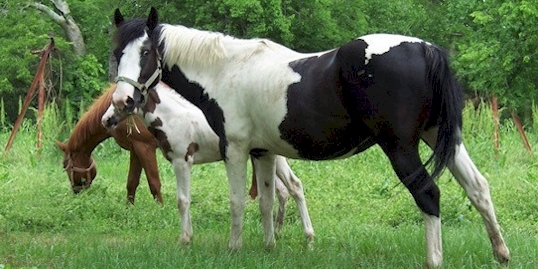 Abstang horses have a straight profile and rounded croup. They are generally a smaller size horse. On average, they are around 14 hands tall. They come in many different colors. Abstang horses are durable, sturdy, sure-footed horse. They have a fearless attitude, are spirited, and are tough. They are fit for endurance or rough terrain. They are often also used for show and pleasure riding. The International Abstang Registry and Association was formed in 1993 by Michele Brown to draw recognition to the Abstrang as a breed. All the registered Abstangs are the result of Mustang/Arabian crosses. There are now over 1500 registered with the IARA. However, as of yet, no two Abstangers have produced offspring. Therefore, Abstangen can not truly be considered a completely separate breed.